These extra heavy-duty mount are the largest in Sky-Watcher mount family. 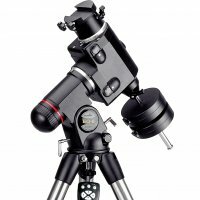 Specially designed to support larger telescope tubes, these high-precision equatorial mount features engraved aluminum setting circles and a latitude scale, built-in illuminated polarscope for both North and Southern Hemisphere use, large R.A. and DEC. locking clamps, and retractable counterweight shaft and removeable counterweights. The proposed strong and rigid stainless steel field tripod is remarkably stable with adjustable height. The saddle plate on the top of the mount accepts generic dovetail bars made by Sky-Watcher and many other companies. The dovetail bar is held securely by dual hand clamps. Setting circles are provided on both axes. The SynTrekTM hand control is designed for the purpose of providing a simple slewing and tracking control. The small and versatile SynTrekTM hand control provides automatic tracking of celestial objects as soon as the power is turned on. The user-friendly interface provides quick access to many other functions the SynTrekTM has to offer. The HEQ5 and EQ6 SynTrek mounts can be upgraded to computerized SynScan system by simply changing the hand control to SynScan hand control. See HEQ5 and EQ6 Pro mounts for specifications for the mounts and details on the SynScan hand control.